Thin slices of Serrano ham and warm poached eggs turn this Spanish-inflected spring salad into dinner: the runny yolk becomes a rich dressing for the delicate frisée greens, and the Romesco sauce adds a nutty, sweet, and slightly spicy element. Be sure to serve this salad with crusty bread, to mop up the delicious oil on the plate. Make Romesco sauce: Heat the broiler and position a rack in the top of the oven. Put the ancho chile in a small bowl and cover with boiling water. Let soak until plump, about 10 minutes. Drain and set aside. Put the tomatoes in a small baking dish, drizzle with a little oil, and place under the broiler until slightly charred, about 3 minutes. Remove from the oven and set aside. Warm a small (6-inch) sauté pan over medium heat, and add 1⁄2 cup of olive oil. When the oil is hot (the bread should just sizzle on contact), add the bread and reduce the heat to medium low. Gently fry the bread on both sides until crisp and golden. (You don’t want it too dark.) Remove the bread from the pan and drain on a paper towel. In the work bowl of a food processor, put the chile, tomatoes, fried bread, piquillo pepper, nuts, and garlic. Pulse at first, then grind to a chunky paste, scraping down the sides of the bowl occasionally. Add the sweet and hot paprika, both vinegars, and the remaining 1⁄4 cup of olive oil, and season with salt. Process again and taste; the sauce should be sweet (not too spicy) and nutty, with a nice balance of acidity. Let it sit for 15 to 20 minutes to allow the flavors to come together, then taste again and add more salt, vinegar, and/or a touch more spice if necessary. Make the salad: Put 1/2 cup of the Romesco sauce, 1/2 cup of the olive oil, and 1-1/2 tsp. of the vinegar in a small bowl and stir to combine (save the remaining Romesco sauce for another use; it keeps well in the refrigerator). Taste and add salt or vinegar if necessary. Set aside at room temperature. Put the asparagus on a baking sheet, drizzle with the remaining 2 Tbs. of olive oil, and toss to lightly coat. Spread out the asparagus to single layer and season with salt. Roast until just tender—it should still have a little bite—about 10 to 15 minutes, depending on the size of the spears. Set aside at room temperature. Shortly before you are ready to serve, fill a straight-sided, heavy sauté pan with about 3 inches of water and bring to a simmer. Meanwhile, scatter the frisée on a platter or individual plates, season lightly with salt, and arrange the asparagus spears on top. Add the remaining 1 tsp. of vinegar to the simmering water. Crack the eggs, one at a time, into a teacup, and gently slide them into the water. Gently simmer the eggs until they are done to your liking, about 3 to 5 minutes. Remove the eggs from the water with a slotted spoon, and blot off any excess water with a clean, lint-free kitchen towel. (For a neater appearance, trim the eggs as well.) 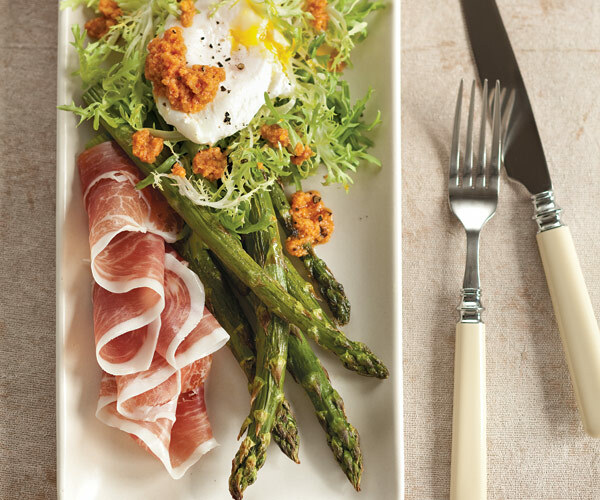 Prop the eggs on top of the asparagus and spoon the Romesco sauce on and around the salad. Drape the Serrano ham or proscuitto on the side, or arrange on a platter and pass at the table. Serve immediately.